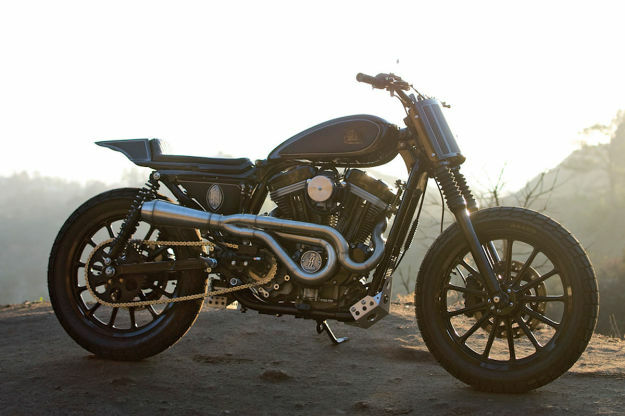 As custom Harleys go, we like ours lean and sporty. 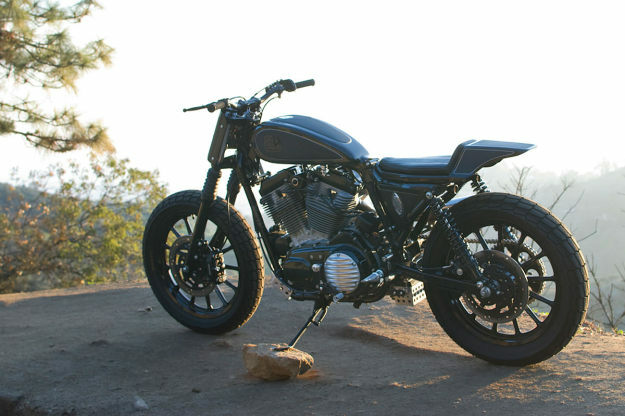 This street tracker from Speed Merchant hits the spot perfectly. 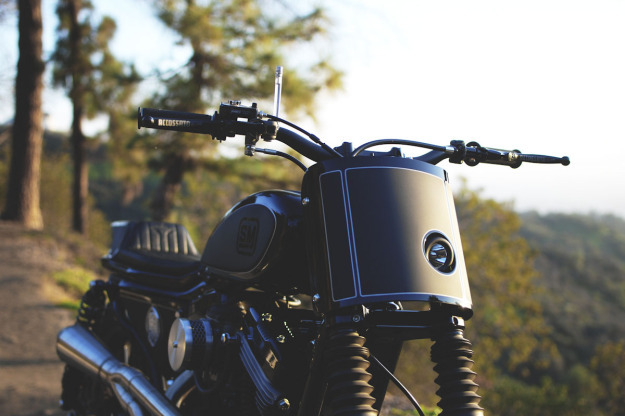 Based in California, Speed Merchant produces bolt-on bits for select Triumph and Harley-Davidson models. Brandon Holstein—one third of the Speed Merchant team—handles all custom fabrication under the Brawny Built moniker. Sean only had three requests: the bike should be black, and he wanted rear-set pegs and a number plate up front. Halfway through the build, Brandon realised that he wasn’t happy with the stock fuel tank. Luckily a good friend donated an almost-complete XR-style tank. All it needed was a filler, tunnel and mounting points. A new oil tank was made from aluminum, and an Anti-Gravity battery installed in a new location. Once that was done, a new subframe was built to hold everything together. 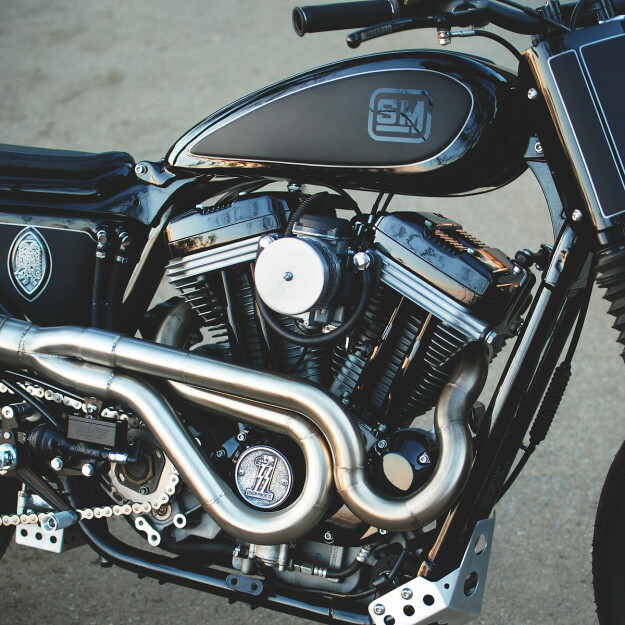 Other custom-made parts include the skid plate, and the curvaceous two-into-one stainless steel exhaust system. Brandon decided to tear into the engine too. He bored it out to 1200cc using Wiseco reverse-domed pistons with a 10:1 compression ratio, and upgraded the cams to Andrews N4 items—a combo he’s used before. 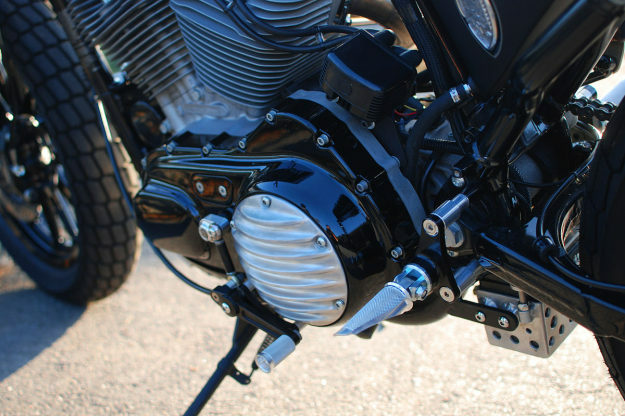 He also installed a Chopper Daves air cleaner, and converted the final drive from belt to chain. The front-end was treated to a set of Speed Merchant Speed Trees and preload adjusters. 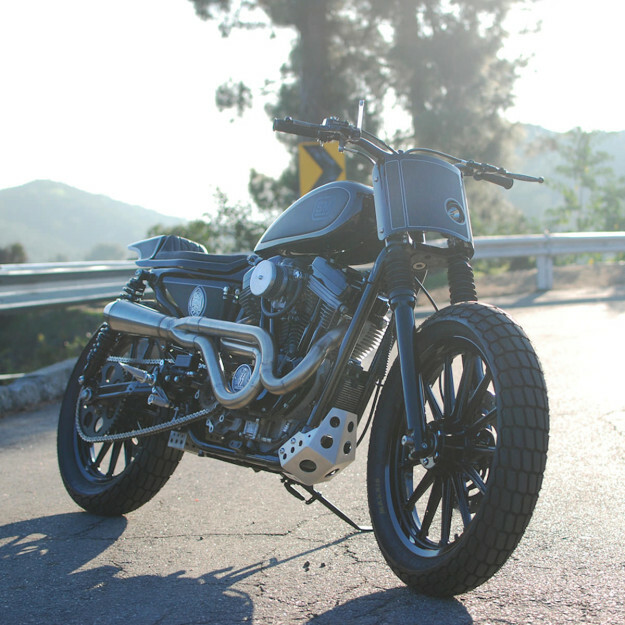 A pair of 19” Harley-Davidson wheels were fitted, shod with Maxxis dirt-track tyres. They’re now equipped with Tokico brake calipers, mounted on Speed Merchant radial mount brackets. The Sporty’s been sprinkled with top-shelf components to finish it off: Magura handlebars, Motion Pro grips and Accossato hand controls. The rear-set foot controls are a mix of Storz Performance and Speed Merchant items. As per Sean’s brief, Brandon fitted a number plate up front, equipped with a Lazer Star light. Sean’s Harley’s been dubbed “Pata Negra”. It’s Spanish for “the black hoof”, named for the prized Iberico ham that’s made exclusively from black Iberian pigs. 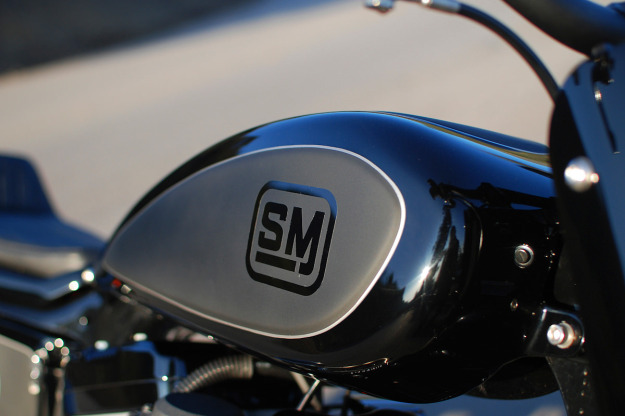 True to its name, it’s been painted in layers of gloss and matte black, executed by Matt at Colorzone Designs. The pin striping was handled by Pacman Line and Lettering. 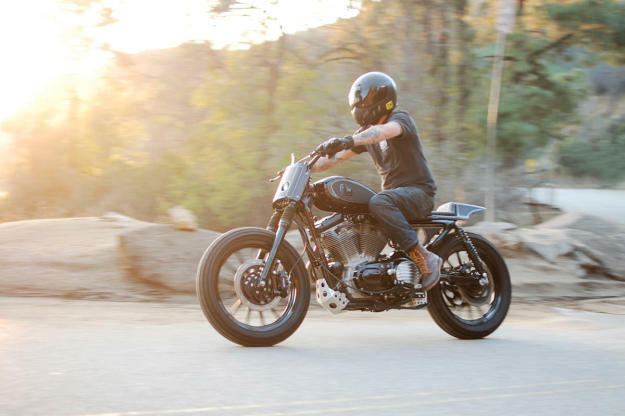 According to Brandon, the Sporty would have turned out very differently had the project been rushed. But Sean’s got a little more waiting to do—he’s still recovering from a bad accident that left his leg broken in two places. We wish him all the best for his recovery. And once he’s able to swing a leg over Pata Negra, we reckon it’s going to be impossible to get him off.